Expert bidet seat reviews you can trust! This is Jbidet.com’s independent review of the Toto Washlet S350e. The S350e is the ultimate bidet toilet seat. It has every feature the basic models have, plus more advanced ones like a lid that automatically opens and closes and a night light. It is the best product that Toto has put together. They have come a long way since inventing the first toilet seat bidet. In this review, we will be looking at the S350e in depth to admire it to help you with your purchasing decision. As usual, we begin the review by taking a look at the appearance, dimensions, and built of the Washlet. If it’s the best bidet toilet seat on the market, it’s got to look like it too, right? Well the design certainly pleases. The S350e features a slim design with the thickest point at the back at just under 4” tall. In comparison, the more basic Toto bidets will have a clunkier design and measure over 7”. The S350e is available in elongated or round versions. The dimensions for the elongated seat are 20-3/4” long, 15-3/10” wide, and 3-15/16″ tall. 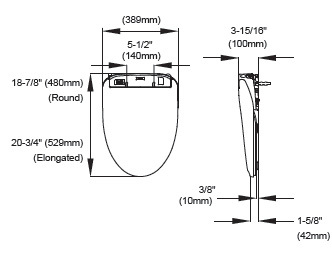 The dimensions for the round seat are 18-7/8” long, 15-3/10” wide, and 3-15/16” tall. The S350e is operated by a remote control, similar to other premium bidet toilet seats. It is powered by two AA batteries. 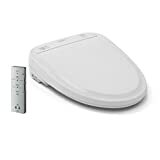 Given its slim design and the use of a remote control, the S350e is the most compact toilet seat bidet you can purchase. The remote control receiver is located on the right corner of the toilet seat. Next to it is a removal button to detach the unit for cleaning the toilet bowl and the deodorizing filter. The LED light indicator display can be found on the top left of the toilet seat. And to the left of the toilet seat is where you can find the automatic night light. As for the remote, there are two sides. 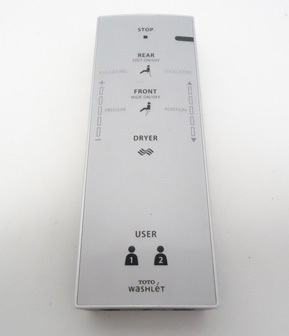 The front side has the buttons “Stop”, “Rear” cleansing (including “Soft Rear”), “Front” cleansing, “Oscillating” (wand moves back and forth to get a more thorough clean), “Pulsating” (water pressure alternates between soft and strong), and “Dryer”. You can use the remote to adjust the pressure and position of the water and wand during cleansing as well. The one thing worth mentioning about the remote is the personal setting buttons. You can store the preferred wand position, water pressure, and water temperature for two users. On the back side of the remote, there is a display of the temperature settings for water, seat, and dryer, and a “Temp” button to adjust their temperatures. There is also a “Menu” button that you can push to select the settings for “Wand Cleaning”, “Auto Energy Saver”, “Timer Energy Saver”, “Pre-mist”, and “Deodorizer”. The Toto S350e comes in Cotton white or Sedona beige. We want to first look at the features that are rare and you can find in the S350e, such as the night light and automatic open/close lid. Then we’ll cover the all the other advanced and basic features that you will find in this product. Because it has every feature invented for the bidet toilet seat, there’s a lot to talk about in this section! The night light is a feature that was added for people who use the toilet at night but do not want to be woken up by a bright bathroom light. Toto put a “soft light” that turns on automatically using sensors. When a person approaches the toilet, the light will turn on to medium. When the person sits down, it will be on high. Then it will gradually dim and turn off after the person leaves. The light is a feature that makes using the bathroom at night a pleasurable experience. Of course, if you don’t want to use the light, you can turn the feature off as you like. The automatic open and close lid is a very cool feature. When you approach the toilet the lid opens automatically. And after you stand up the lid will close automatically after about 90 seconds. You can change the settings to open both the lid and the seat. If you only want the lid to open automatically, you can manually press the button on the top of the remote to lift the seat and bring it down after you’re done. The next feature we want to talk about is the ewater+ system. “ewater+” is Toto’s way of saying electrolyzed water. Electrolyzed water is ordinary tap water that contains sodium chloride and is a disinfectant, cleaner, and sanitizer more effective than household bleach. You can think of it as salt water that has been passed through an electric current. It is a safe way to kill many bacteria and viruses. It’s even safe to drink (if you don’t mind the taste)! Because of its non-toxic properties many food preparation facilities and hotels use it to clean. The problem is the electrolyzed water can’t be stored for long because it loses its potency. However, Toto developed a way to integrate that into its toilet seats, by having regular water turn into electrolyzed water each time the toilet flushes. When you stand up from the toilet, “ewater+” sanitizes the wand automatically and is sprayed into the toilet bowl. Plus, the S350e has a Pre-mist that is sprayed as you approach the toilet to make it difficult for dirt to adhere and a Deodorizer which starts when you sit down, making the S350e one of the cleanest, most easiest to maintain toilet seat bidet ever. These functions work by sensors located on the toilet seat, which detect your movement. Next we want to talk about the Timer Energy Saver. This function is added on top of the Energy Saver feature, which is present in all the Toto products we’ve reviewed. This feature helps conserve energy during times when the toilet is used less frequently. The Energy Saver is a smart function. It automatically determines the periods when the toilet is used less frequently and not at all. It takes about 10 days for it to recognize your toilet habits, and it will automatically launch into energy saver mode if you have the setting turned on. During periods of infrequent use, the Toto Washlet S350e will lower the toilet seat temperature to save energy. On the other hand, the Timer Energy Saver allows you to be in complete control of when you want the heated seat to be completely off. If someone happens to use the toilet during this time, the toilet seat heater will turn on temporarily, but it will take 15 minutes to warm up. You can set both the automatic Energy Saver and Timer Energy Saver on at the same time. For instance you might want to set the Timer Energy Saver from 8am to 5pm when nobody is home, and have the Energy Saver running so that it automatically lowers the temperature during times when the toilet is not used at much, such as from midnight to 6am. One other cool advanced feature that we touched upon in the design section above is the removal button on the S350e. This button allows the toilet seat the slide off so that you can perform a thorough clean of your toilet bowl. Now for the more common features. There are four dedicated cleansing modes: Rear, Soft Rear, Front, and Wide Front. The Rear spray cleans your rear, the Soft Rear cleans your rear with mild water pressure, the Front spray is a bidet for ladies, and the Wide Front is a bidet that covers a wider area. While using each of these sprays, you can turn on the oscillating feature which will move the wand back and forth to wash more thoroughly. By turning on the pulsating feature the water pressure will alternate between soft and strong, which feels as if you’re being given a massage. The cleansing functions of the S350e Washlet are highly customizable. You can adjust the water pressure and washing position with the buttons located on the left and right side of the remote. They can be adjusted to 5 different water pressures and 5 different positions. You can also adjust the water temperature. The minimum water temperature is 86°F/30°C and maximum water temperature is 104˚F/40˚C. Many years ago, when Toto first designed bidet toilet seats, they discovered that the ideal temperature was around 38˚C. Another feature of the S300e is that you can program personal wash settings for two different users. You can store a user’s choice of wand position, water pressure, and water temperature. To store these settings, simply press and hold “User 1” or “User 2” while cleansing is in progress. When you want to use the settings, you just press the appropriate User that has your settings stored. The Washlet has an air dryer that is customizable as well. You can adjust its temperature from low, which is about 95°F/35°C, to high, which is about 140°F/60°C. The adjustable heated seat has a surface temperature between 82˚F/28˚C to 97˚F/36˚C. You can turn the heated seat completely off or on auto energy saver mode which sets the seat to about 79˚F/26˚C. You can wipe the wand down using the wand cleaning feature (this is different from the auto wand sanitization with “ewater+”). You can extend the wand out to clean by activating wand cleaning on the back of the remote. It’s recommended to clean the nozzle monthly or when you notice dirt. The wand will automatically retract after five minutes. Use a soft, wet cloth to wipe the wand. Be careful not to pull, push, or press the wand with excessive force as this can cause damage. When you’re finished you can use the remote to turn it off. Finally, many people ask this question: Do you need a hot water supply? The answer is no. The toilet seat heats the water. But you will need to plug the seat into an electric outlet. Total rating (out of 5). Buying a bidet toilet seat is a huge investment, let alone a luxury one. Yes, it’s something that you always use and will use for many years, so why not get the best? On the other hand, is it worth spending the extra money on advanced features? To help with your decision, we put together some reasons why the Toto Washlet S350e might suit your needs. The most obvious drawback about the S350e is the price tag. You’re probably going to be spending around $800 for this toilet seat. If anyone asks you how much you spent on it, you’re probably going to want to avoid that question, especially if they’ve never used a Japanese style toilet before or seen one with a lid that opens and closes automatically (and once they do their reactions are priceless!). The Toto s350e was not meant to be a basic toilet seat. And with the advanced features come the high price tag. The Toto Washlet S350e is a toilet seat with all the bells and whistles. It features a slim design and cool features like an automatic open/close seat and lid, night light, and electrolyzed water sanitation. It is a premium bidet that wows. You can buy this bidet conveniently online or at your local home improvement store. Plus, if you want some help with your installation, you can usually hire a handyman through your chosen retailer to help you with it.